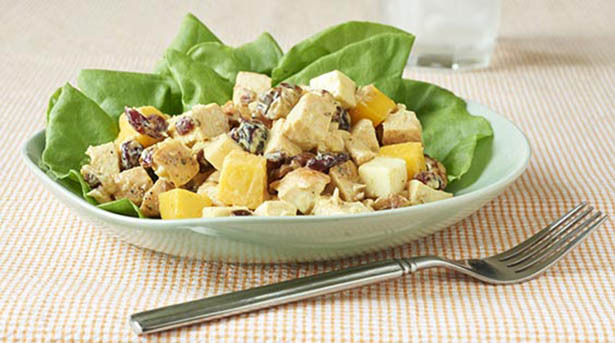 Add a touch of sweetness to this main-dish chicken salad with dried cranberries and walnuts. Cheese cubes boost both the protein and the calcium in this nutrient-packed salad. Grill chicken breasts, cut into small pieces and set aside. In a medium bowl, blend yogurt and curry with a whisk and stir in chicken, mango, cranberries, walnuts and Mozzarella. Mix well and serve on lettuce leaves if desired.